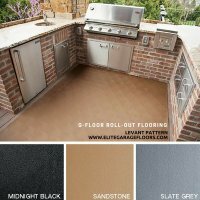 Some G-Floor Sizes and Colors are discontinued. Visit our SALE page for a list of discounted inventory available. 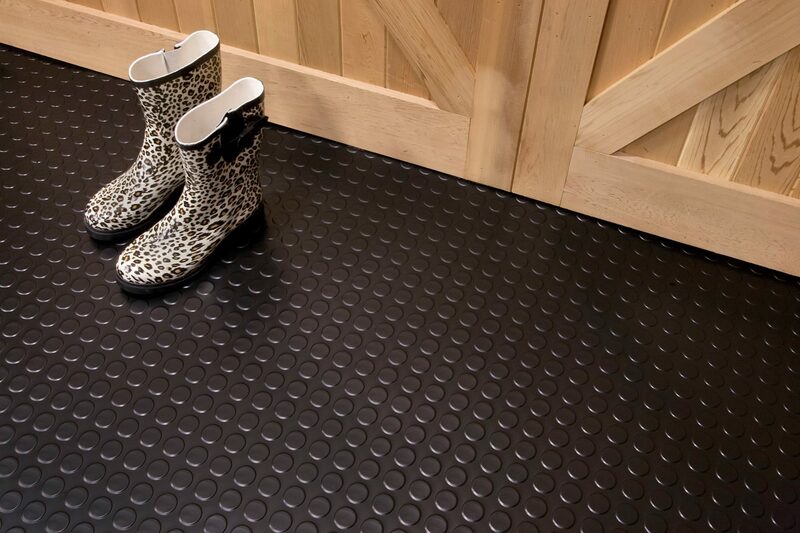 The G-Floor roll-out flooring comes in Ribbed Pattern, Coin Pattern, Diamond Pattern and Levant Textured Pattern and is available in Midnight Black, Slate Grey or Sandstone Tan. Stocked sizes: 5' x 10', 7.5' x 17', 8.5' x 22', and 10' x 24' - Custom Cut Lengths available up to 100' (stock size ships 3-5 business days) and custom cut lengths (ships 7-10 business days). 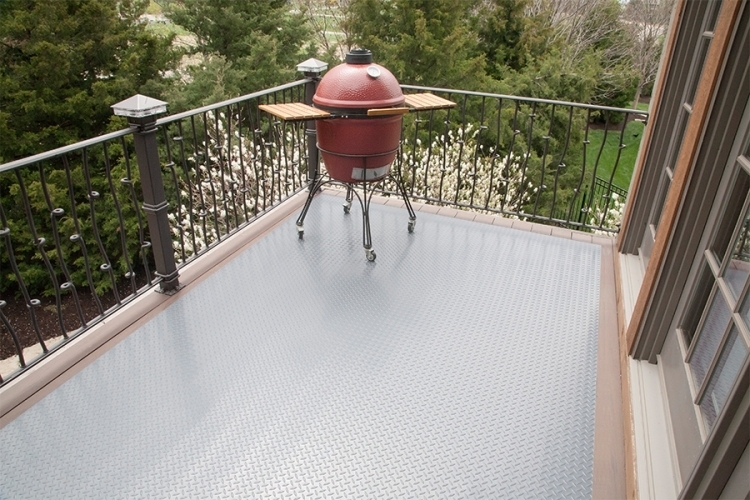 Easy to install, DIY, no adhesive needed, simply unroll and cover wall to wall or just parking mat sizes. Waterproof, Extremely durable, Resistant to oil, battery acid, break fluid, mud, salt, antifreeze & other common chemicals. Prevents concrete deterioration & contamination. 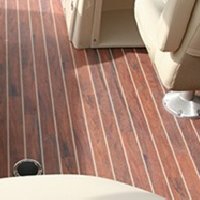 G-Floor vinyl flooring goes beyond the garage and into many other areas: basement, trailer flooring, event flooring, boats, motorcycle mats, equipment mats, custom print flooring as well. 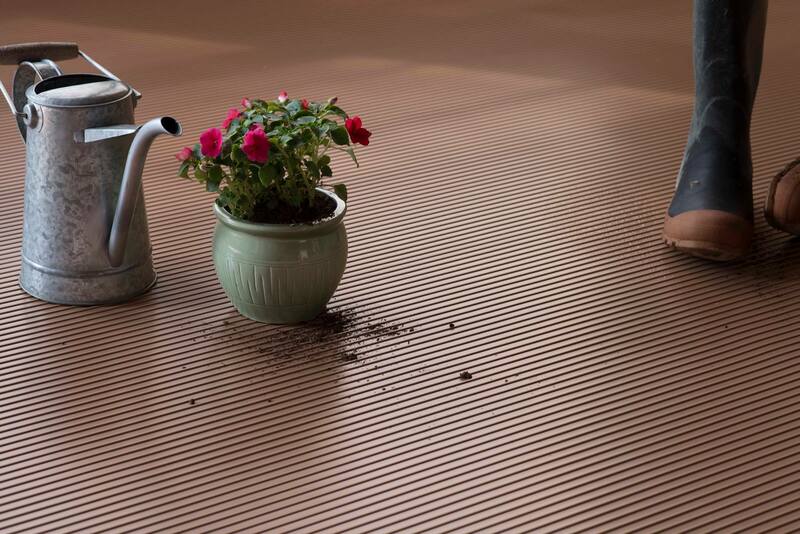 Made of 100% polyvinyl, G-Floor vinyl floor coverings provide superior durability, easy maintenance and quick installation. 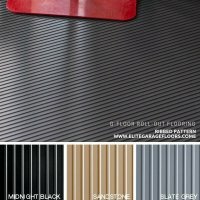 Enjoy the benefits of G Floor vinyl flooring for years to come. Limited Lifetime Warranty. Made In USA! Free Ground Shipping. Quantity Discounts Available. Contact our sales staff with questions, or additional information. 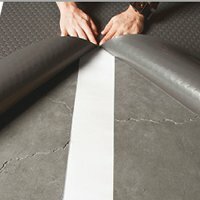 G Floor vinyl roll out floor covering is available in many sizes, patterns and colors. Made in the USA! Limited Lifetime Manufacturer Warranty. 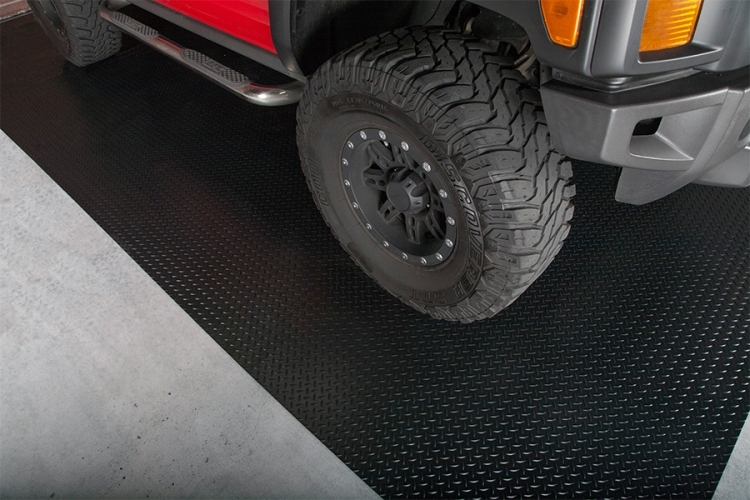 World's Largest Producer of Garage Floor Mat Products • Producer of the World's Largest Roll Out Garage Floor Covering. 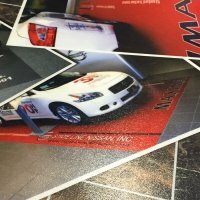 Request a free sample or quote. Keep your garage, shop, basement, trailer, and many other areas looking like new. Protect your garage floor year round from corrosive road material such as antifreeze, oil, salt and battery acid. Helps prevents concrete deterioration. G Floor has a Non-porous surface, so it allows easy cleanup of oil and antifreeze and can be cleaned with soap and water. Vinyl floor cleaners may be needed to remove stubborn debris. This is not a stain proof product. G Floor comes in several patterns; Coin Pattern, Ribbed Pattern, Diamond Pattern, Levant Pattern. Our in stock sizes ships next business day, and custom cut lengths ship within 3 to 5 business days. Our pricing includes free curbside delivery. 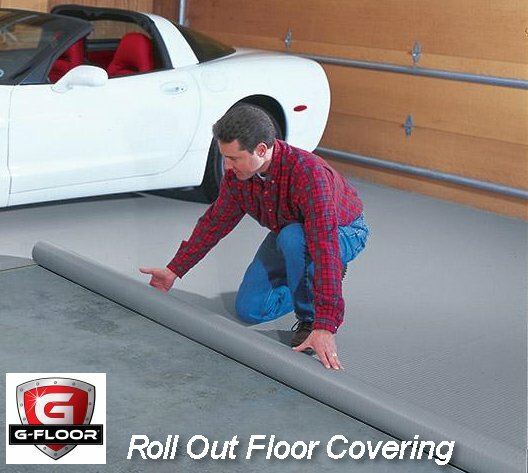 Why should you use G Floor Roll Out Garage Floor Covering instead of epoxy coatings? 1) Easy Do it Yourself Installation: Use G Floor instead of epoxy. The preparation for painting an epoxy-coated concrete floor can be intensive- potentially taking several days to install. Even then, there is no guarantee the coating will stick. Painting a garage floor involves many variables such as prep-time, humidity, temperature, dry-time, and the skill to do it. Yes, there are so called "Do-It-Yourself" Epoxy kits. However, properly painting a concrete floor requires skill that does not come in a kit. And even if one has the skill, the numerous steps required for a quality garage flooring paint job such as degreasing, etching, taping, drying and etc. make painting a basement or garage floor less than practical. 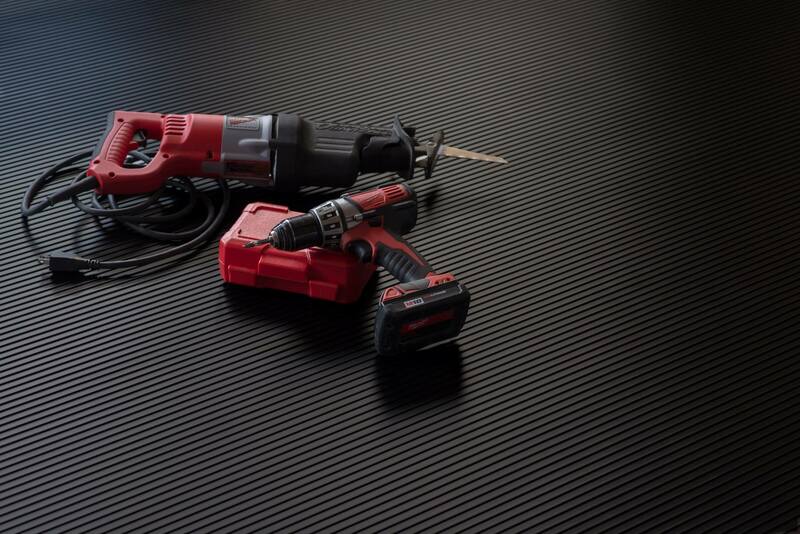 With G Floor Roll Out Garage Flooring, simply unroll onto the garage floor and trim the edges with a utility knife and use your floor. 2) Lower Cost: A quality professional coating company will likely charge anywhere from $5 to $15 a square foot in labor fees alone. Snap-together floor tile solutions will cost $3 to $6 per square foot for the tiles alone—plus hourly labor charges for proper installation. 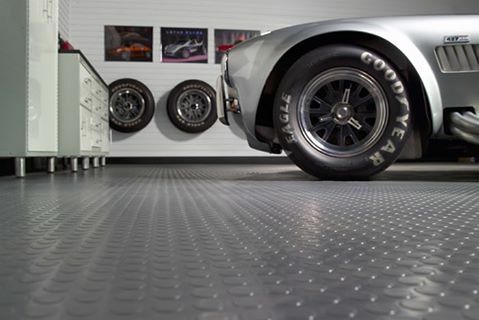 With BLT Roll Out Garage Flooring®, material costs will be lower and labor costs will be eliminated. 3) Longer-term Durability: Once a floor is epoxy painted or tiled, these concrete garage flooring solutions are subject to chipping, peeling, cracking, scratches and hot-tire pickup. These normal "wear and tear" realities can lead to the reapplication of the paint or tile within a matter of years. 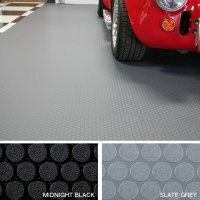 G Floor Roll-Out Garage Flooring has been manufactured from tough, specially formulated, polyvinyl material that will beautify in minutes and last for years. 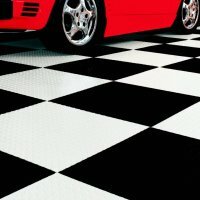 Traditional flooring installation on garages and commercial spaces is time consuming, stressful, and expensive. Additionally, all of the labor that goes into the application of these floors can be easily negated with a damaged, sub-par flooring material. 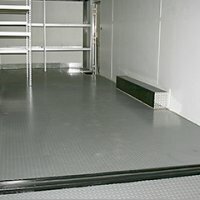 There is no floor as strong or as easy to install as G Floor's Commercial and Garage flooring. 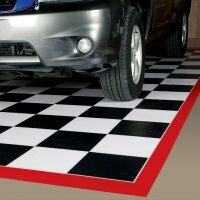 It installs instantly and with limited "heavy-lifting" involved and will last for years after competing garage and commercial flooring expire or are damaged. 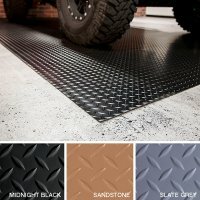 Garage Floor Covering Benefits The G Floor Garage Floor Cover by Better Life Technologies offers unique patterns such as Ribbed, Coin Top, Diamond Pattern, and Smooth Levant and is available in multiple colors and thicknesses. 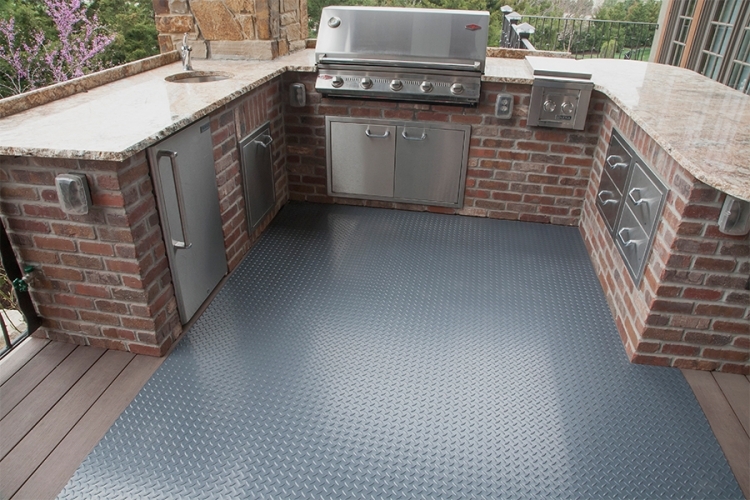 G Floor is 100% high quality polyvinyl throughout the entire product. 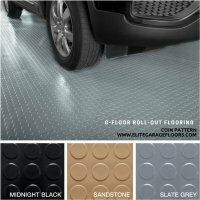 Most other garage floor covering products only use high quality materials on the top 10%–20% of their product and laminate with lower-grade material that does not offer the same protection throughout. Some products even have three layers of filler using some of the poorest quality materials available. G-Floor is solid polyvinyl and has the same resistances throughout the entire product top to bottom. Get a free sample and literature mailed to you today, or call our experts at 361-906-0863 with technical questions.